به واسطه وقوع مخاصمات مسلحانه فراوان بین انسانها، تمدنها، مذاهب و دولتها، ایده صلح و تضمین حقوق انسانها همواره یکی از آرمانهای اصلی بشریت بوده است. بر همین اساس، جامعه بین الملل به ویژه در سده های جدید کوشیده است به انحاء مختلف در جهت کاهش تلفات جانی و مالی ناشی از این مخاصمات گام بردارد. از جمله مهمترین این تلاشها وضع قوانین و مقرراتی تحت عنوان حقوق بشر دوستانه بوده است به گونه ای که دولتهای درگیر در مخاصمات مسلحانه ملزم به رعایت و احترام به این قوانین باشند. کاملا روشن است که مخاصمات مسلحانه هیچ اثری بر حقوق بشر دوستانه ندارند، اما سوال این است که این مخاصمات چه تاثیری بر قواعد حقوق بشر دارند؟ و آیا به محض وقوع یک مخاصمه مسلحانه، اجرای حقوق بشر متوقف می شود و فقط حقوق بشردوستانه اعمال می گردد؟ این مقاله می کوشد نشان دهد که به هنگام مخاصمات مسلحانه قواعد حقوق بشر مکمل قواعد حقوق بشردوستانه است و صرف وقوع یک مخاصمه مسلحانه به معنی تعطیلی حقوق بشر نیست. Due to the numerous armed conflicts between nations and governments based on, cultural and religious factors, the idea of peace and human rights have always been one of the main aspirations of civil activists. Accordingly, the international community,particularly in the 20th and 21th centuries, has tried to reduce the loss of life and property caused by the hostilities in various way.In this respect,one of the most important efforts has been the enactment of laws and regulations under the humanitarian rights and making the Governments involved in armed conflict to respect these rules. It is clear that armed conflicts do not have inflict humanitarian rights,but the question that is raised here, is that what are the effect of armed conflict on human rights? And whether upon the occurrence of an armed conflict, international law and humanitarian actions would be able to stop violations of human rights and encourages the enforcement of human rights. A theoretical analysis of the relationship between human rights and armed conflict, this article tries to show that the rules of human rights are supplementary rules of humanitarian rights during the armed conflict and the outbreak of an armed conflict is not a license to suspend human rights. ترابی، محمد (1387)، حقوق بشر و حقوق بشردوستانه در مخاصمات مسلحانۀ غیر بین‌المللی (داخلی)، پایان نامۀ کارشناسی ارشد، دانشگاه آزاد اسلامی واحد تهران مرکزی. چاردین، سی باین (1368)، جنگ دوم جهانی، ترجمۀ غلامحسین قراگوزلو، تهران: انتشارات تونس. حبیب زاده، توکل (1384)، «ساخت دیوار حائل در سرزمین‌های اشغالی فلسطین از دیدگاه حقوق بین‌الملل، درآمدی بر رأی مشورتی دیوان بین‌المللی دادگستری»، دو فصلنامة دین و ارتباطات، شمارۀ 28، صص 70-106. رستم زاد، حسینقلی (1384)، «جامعۀ بین‌المللی و تعهدات بین‌المللی»، مجلۀ حقوقی بین‌المللی، دوره 22، شمارۀ 33، صص 71-9. رفیعی، کیوان (1386)، کالبد شکافی حقوق بشر، تهران: انتشارات مجموعۀ فعالان حقوق بشر در ایران. رمضانی قوام آبادی، محمدحسین (1383)، « تأملی چند بر منابع قراردادی حقوق مخاصمات مسلحانۀ غیر بین‌المللی»، مجلۀ تخصصی الهیات و حقوق، دوره 5، شمارۀ 13، صص 156-130. رنجبریان، امیر حسین (1373)، «تأملی بر حقوق بشر»، نشریۀ راهبرد، شمارۀ 4، صص 137-164. روسو، شارل (1369)، حقوق مخاصمات مسلحانه (جلد دوم)، ترجمۀ دکتر سید علی هنجبی، تهران: دفتر خدمات حقوقی بین‌المللی. شریعتی، سعید (1384)، حقوق ملت و دولت در قانون اساسی، تهران: انتشارات کانون اندیشۀ جوان. شریفیان، جمشید (1380)، «بین‌المللی شدن حقوق بشر»، فصلنامۀ سیاست خارجی، شمارۀ 59، صص801-828. شریفیان، جمشید (1384)، «مداخلۀ بشردوستانه و سازمان ملل متحد»، فصلنامۀ بصیرت، سال دوازدهم، شمارۀ 34، صص 26-39. ضیائی بیگدلی، محمد رضا (1380)، حقوق جنگ، تهران: انتشارات دانشگاه علامه طباطبایی. ضیائی بیگدلی، محمدرضا (1383)، « نگرشی بر مسئولیت بین‌المللی ناشی از نقض حقوق بشر و حقوق بشردوستانه»، مجلۀ پژوهش حقوق و سیاست، شمارۀ 13، صص 5-18. عباسی اشلقی، مجید (1383)، «تحول نظری مفهوم حقوق بشر و جایگاه آن در روابط بین‌الملل»، فصلنامۀ اطلاعات سیاسی ـ اقتصادی، شمارۀ 201 و 202، صص90-101. فریمن، مارک (1383)، «حقوق بشر و حقوق بشر دوستانه در درگیری‌های مسلحانه غیر بین‌المللی»، ترجمه سعید ارادت، نشریه اطلاع رسانی حقوقی، دوره 46، شمارۀ 10، صص36-47. 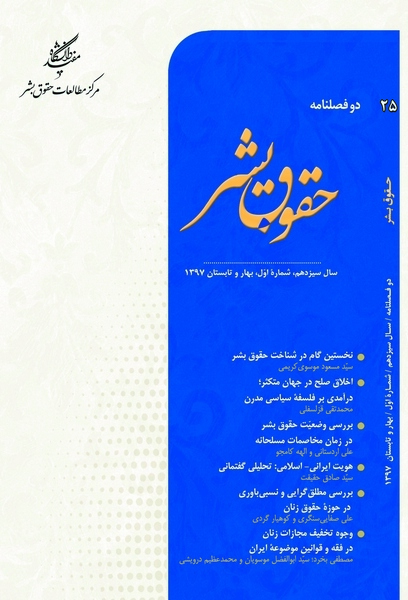 فلک، دیتر (1391)، حقوق بشردوستانه در مخاصمات مسلحانه، ترجمه: دکتر سید قاسم زمانی، ویرایش: دکتر سید قاسم زمانی و دکتر نادر ساعد، تهران: موسسۀ مطالعات و پژوهش‌های حقوقی شهر دانش. کولب، رابرت و هاید، ریچارد (1394)، درآمدی بر حقوق مخاصمات مسلحانه، ترجمۀ سید حسام الدین لسانی، تهران: انتشارات مجد. مصفا، نسرین، عالم، عبدالرحمن، طارم سرایی، مسعود، و مستقیمی، بهرام (1366)، «مفهوم تجاوز در حقوق بین‌الملل»، مجلۀ حقوقی بین‌المللی، دوره 7، شمارۀ 8، صص 8-52. ممتاز، جمشید و امیر حسین رنجبریان (1384)، حقوق بین‌الملل بشردوستانه، مخاصمات مسلحانۀ داخلی، تهران: نشر میزان. ممتاز، جمشید و قربان نیا، ناصر (1385)، «چارچوب هنجاری نظام بین‌الملل حقوق بشر و بشردوستانه»، فصلنامۀ نامۀ مفید، دوره 12، شمارۀ 55، صص3-18. میر عباسی، سید باقر (1385)، حقوق بین‌الملل عمومی، تهران: نشر میزان. نظیفی، عباس و جعفری، اصغر (1390)، «نگاهی تحلیلی بر مخاصمات مسلحانه در دو دیدگاه: اسلام و حقوق بین‌الملل»، فصلنامۀ دیدگاه‌های حقوق قضایی، شمارۀ 54، صص 179-230. Balendra, Natasha (2007). “Defining armed conflict”, Oxfored Journal of Law,Vol. 29, No. 6, pp. 2461-2516. Cowell, Frederich (2013). “Sovereignty and the Question of Derogation: An Analysis of Article 15 of the ECHR and the Absence of a Derogation Clause in the ACHPR”, Birkbeck Law Review, Vol.1, No.1, pp. 135- 162. Cullen, Antony (2010). The Concept of Non- International Armed conflict in International Humanitarian Law, New York: Cambridge University Press. Donnelly, Jack (1999). “Human rights, Democracy and Development” Human Rights Quarterly, Vol.21, No.3, pp. 608-632. Droege, Ordula (2007). “The Interplay between International Humanitarian Law and International Human Rights Law in Situations of Armed Conflict”, Research Paper, Vol. 40, No.2, pp. 310-355. E.Graham, David (2012). “Defining Non - international Armed Conflict: A Historically Difficult task”, International Law Studies, Vol. 88, pp. 43-55. Egorov, Sergey (2000). “The Kosovo Crisis and the Law of Armed Conflicts”, International Review of the Red Cross, No. 837, pp.183-192. European Training and Research Centre for Human Rights and Democracy (ETC) (2012). Understanding human rights; manual on human rights education, Edited by Wolfgan Benedek, Vienna: European Training and Research Centre for Human Rights and Democracy (ETC). Gasser, Hanse Peter (1983). “Internationalized Non-international Armed conflict: case studies of Afghanistan, kampugheu, and le Banon”, The American University Law Review, Vol.33, No. 145, pp.145-161. Greenwood, Christopher (1998). “International Humanitarian law and United Nations Military operations”, Yearbook of international humanitarian law, Vol.1, pp. 3 - 34. Hartman, Joan.F (1981). “Derogation from Human Rights Treaties in public Emergencies”, Harvard international law Journal, Vol. 22, No. 1. Knable, Patrick (2005). “The Relationship between International Humanitarian Law and International Human Rights Law in Situations of Armed Conflict”, The New Zealand Postgraduate Law e-Journal, Issue 5. Lamp, Nicolas, & Trif, Dana (2009). “United Nations Peacekeeping Forces and the Protection of Civilians in Armed conflict”, Hertie school of Governance- working papers, No.47, pp.1-57. Lubell, Noam & Derejko, Nathan (2013). “A Globle Battlefield? Drones and the Geographical Scop of Armed Conflict”, Journal of international criminal Justice, Vol.11, Issue. 1, pp.1-23. Mc Nair, Lord (1961). The Law of Treaties, Oxford: Clarendon Press. Mrazek, Josef (2010). “Armed Conflict and the Use of Force”, CYIL, Vol.1, pp.87 -109. Nasu, Hitoshi (2009), “Status of Rebels in Non - international Armed Conflict”, ANU college of law Research paper, No. 10 - 71, pp 239 - 260. Paulus, Andreas & Mindia Vashakmadze (2009). “Asymmetrical War and the Notion of Armed Conflict - a tentative conceptualization”, International Review of the Red Cross, Vol.91, No .873, pp 95-125. Schindler, Dietrich (1982). “International Humanitarian Law and Internationalized Armed Conflicts”, International Review of the Red Cross, Vol.22, No. 230, pp.255-264. Ullan, Aman & Same Uzair (2011). “Derogation of Human Rights under the Covenant and Their Suspension During Emergency and Civil Martial Law, in India and Pakistan”, Research Journal of South Asian Studies, Vol.26, No.1, pp.181 - 189. Verhoeven, Sten (2007). “International and Non - international Armed Conflict”, Institute for International law-working paper, No. 107, pp. 1-22. Walter, Franziska, Manfred Nowak, Christin Sommer, Helmut Sax, George Huber & Graben Warter (2010). Human Rights Manual, Vienna: Austrian Development Agency (ADA). Wenar, Lief (2005). “The nature of human rights, Edited by A. Follesdal and T. Pogge”, Ethics, Vol.1, pp.285-293. Human Rights Committee, General Comment No.29 Article 4: Derogations during a State of Emergency, 31 August 2007, CCPR/C/21/Rev.1/Add.11. ICJ Report, Legality of the Threat or Use of Nuclear Weapons, Advisory Opinion of 8 July 1996.
International Law Commission (57th session), First Report on the Effects of Armed Conflicts on Treaties, (by Mr.Ian Brownlie, special Rapporteur), No. A/CN 4 /552, Geneva, 2 May, 3 June, 4 July & 5 August 2005. Picted, Jean, Commentary on the Geneva Convention of 12 August 1949. ICRC, Geneva 1952. United Nations Office for the Coordination of Humanitarian Affairs, (2003). Glossary of Humanitarian Terms in Relation of Civilian in Armed Conflict, NewYork. United Nations, Official Report of the Economic and Social, Eleventh Session, Supplement No .5, U.N. Doc: E /1681. Uppsala Conflict Data Program, Armed conflict Dataset Codebook, Version 4, 2012. “How is the term Armed conflict Defined in international humanitarian law?” (2008). International Committee of the Red Cross (ICRC), opinion paper.pp.1-5. Available at: https://www.icrc.org/eng/assets/files/other/opinion-paper-armed-conflict.pdf. Barquero, Ray (No Data). “The [New] Thresholds of Non - international Armed Conflict - A Product of Jurisprudential Provenance?”, pp. 1-50. Available at: http://www.academia.edu. Higgins, Noelle (2004). “The Application of International Humanitarian Law to Wars of National Liberation”, Journal of humanitarian Assistance. Available at:http://sites.tufts.edu/jha/files/2011/04/a132.pdf. Human Right Council Opens Special on the Human Rights Situation in the Occupied Palestinian Territory, 23 July 2014. http://www.ohchr.org. ICC, The Prosector V.Germain Katanga and Mothiev Ngudjolo Chuni, Case No. ICC - 01 /04 - 01 / 07, Decision on the Conformation of Charges, 30 October 2008 .Available at: www.icc.cpi.int. ICJ Report, advisory opinion of 20 July 1962, Certain Expenses of the united Nations, Available at: www.icj-cij-org. ICRC, Armed Conflicts Linked to the Disintegration of Structures: Preparatory Document Drafted by the International Committee of the Red Cross for the First Periodical Meeting on International Humanitarian Law (1998), Geneva. Available at: www.icrc.org. International Covenant on Civil and Political Rights, Adopted 16 Dec 1966, by General Assembly resolution 2200 A (XXI). Entry into force 23 March 1976 (IccPR) No. 19668. Available at: https: /treaties. UN. org.